Ken Clarke needs no introduction. One of the genuine 'Big Beasts' of the political scene, during his forty-six years as the Member of Parliament for Rushcliffe in Nottinghamshire he has been at the very heart of government under three prime ministers. He is a political obsessive with a personal hinterland, as well known as a Tory Wet with Europhile views as for his love ofKen Clarke needs no introduction. One of the genuine 'Big Beasts' of the political scene, during his forty-six years as the Member of Parliament for Rushcliffe in Nottinghamshire he has been at the very heart of government under three prime ministers. He is a political obsessive with a personal hinterland, as well known as a Tory Wet with Europhile views as for his love of cricket, Nottingham Forest Football Club and jazz. In Kind of Blue, Clarke charts his remarkable progress from working-class scholarship boy in Nottinghamshire to high political office and the upper echelons of both his party and of government. But Clarke is not a straightforward Conservative politician. His position on the left of the party often led Margaret Thatcher to question his true blue credentials and his passionate commitment to the European project has led many fellow Conservatives to regard him with suspicion - and cost him the leadership on no less than three occasions.Clarke has had a ringside seat in British politics for four decades and his trenchant observations and candid account of life both in and out of government will enthral readers of all political persuasions. Vivid, witty and forthright, and taking its title not only from his politics but from his beloved Miles Davis, Kind of Blue is political memoir at its very best. A long political career is covered in quite a short space of time. All the major incidents of the day and the very many political appointments are covered. Ken Clarke mentions his relationships with his colleagues but doesn’t say too much that is controversial. His passion for the European project is evident. I would have liked a bit more about what the prime ministers he worked under were actually like. Acceptable face of ConservatismAs a lifelong Labour supporter I've been privileged to have followed virtually all of the political span that this book covers. I've always had a secret admiration for Ken Clarke and liked his affable character and his political performance; indeed, often wondered why he was a Tory. I very much enjoyed this book and feel rather sad that, in this post-Brexit UK, we'll not have his political wisdom and experience. He will be greatly missed. Quote: "David Cameron's chancer-like gamble taken for tactical, internal, party management reasons turned out to be the worst political mistake made by any British Prime Minister in my lifetime." Well said Ken. An excellent entertaining memoir very well read by the author himself. Good to hear a bit of common sense on the referendum issue but also lots of detail from a great political career- and a son of Nottinghamshire to boot. This is the kind of book which makes you thankful that there are, or is it were, some people in a parliament that still speak with common sense. It also shows that the problems in the Conservative party are not unique to the current time. 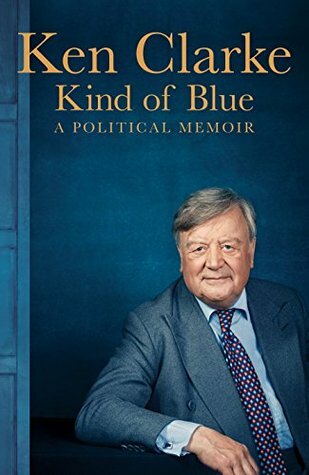 Well worth reading, whatever party you support this is a very well written book which I predict you will finish, glad to have know Ken Clarke! Brilliantly written autobiography of one of the great men of recent British politics. I felt a real sense of satisfaction on finishing in the same way as any political biography but a real sense of dejection over where, one year after the calamitous Brexit referendum, Britain finds itself. Unfortunately Mr Clarke turns out to be much more Tory than I thought and was instrumental in many of the party's policies that I disagreed with the most. That said it's an interesting and easy read and I am still left liking the man if not the politician. It was a very good book which is so accessible for those who perhaps unlike myself may not be entirely obsessed with politics! Whatever your political stance, it’s certainly worth reading it, if you enjoy biographies like I do. A full and fascinating political lifeAn excellent read for anyone interested in a true heavyweight politician recalling some of the major events of the last 50-years. Interesting book as doesn't go into the usual detail of bill after bill after bill that some political biographies do, as does have the "personal" touch. Superb biography. Very engaging, and a great insight to such a prominent public figure and politician.